This entry was posted on February 6, 2019 by Chris Elliott. Solid or engineered hardwood flooring look the same once they are installed, but they have some very significant differences. The main difference is the way in which they have been made. This then affects how and where they can be used. Engineered wood flooring has a top layer of real wood, and multiple base layers underneath to give it additional strength and stability. The only part that you will see once it is installed, is the top layer of real wood. The base layers are usually made from plywood or Eucalyptus. 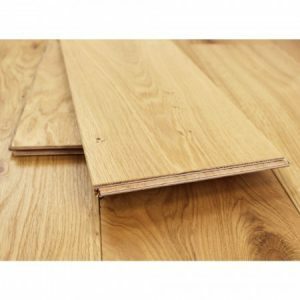 Planks of engineered flooring can either have a tongue and groove fitting system or a click fitting system. Engineered planks of flooring are much more versatile than solid wood. 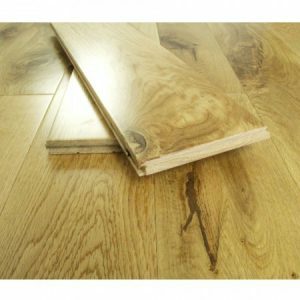 Solid wood flooring is made from one solid piece of wood. The plank is cut straight from the trunk of the tree, then machined into flooring. Solid hardwood is still very popular. It is widely desired as it is thought of as the most luxurious flooring for any home. It must be fixed into position during installation, as it is not stable enough to be floated. Finally, for more information about solid and engineered flooring, have a look at our article: Should I choose solid or engineered hardwood flooring?